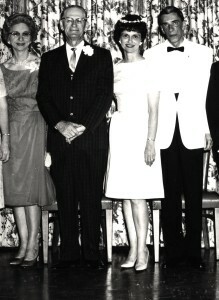 My Daddy | Marjorie R. Barlow, Ph.D. My Daddy – Marjorie R. Barlow, Ph.D.
My wedding to Paul (June 8, 1964). R to L: Mother, Daddy, Me, Paul. I think I was in my Mother’s belly when I first became attuned to the sound of my Father’s voice and sensitive to his moods. He was the dominant force in my early hypnotic* childhood years. I don’t know when he first yelled at me or hit me with a swat of his hand to my backside. I was told that I was spanked when I stepped in a mud puddle at about the time I learned to walk. My favorite escape was playing the piano from age four on and his reaction to that “noise” was so vehement that I would stop playing the moment I heard his footsteps on the back porch. When he entered the house after his hard work in the fields on our farm, the mood changed and everything was about his desires, wants, and feelings. I was in tune with his presence, his words, his tone of voice, his facial expressions, his body postures, movements, gestures, and his moods. Meals at our house were dominated by his voice. He prayed his blessing and thanks for the food and then he began his expositions. His words were usually critical of someone or something—in our community, at our church, in our family. He announced in long diatribes who was “naughty” or who was “nice.” And, not very many were on his list of nice people. Nearly everyone was subject to his evaluations and criticism. By the way, his punishment of me didn’t help me become truthful (I was spanked for lying) nor full of confidence (I felt his shame that I could not make him look good). The real truth about punishment of children or adults is that it is abuse (usually learned from a previous generation who believed it was the way of conquering our sinful nature). But, I did learn to be very smart about what I revealed. And, I became an expert in deceit and covering up what I knew would be displeasing to him. I later learned that all my defenses were exercised in my attempt to keep him from imploding, exploding, or dying. I cared so much about his well being that I shaped all my behavior to assure he would survive. His non-verbal treatment of me trained me to live in the Transactional Analysis “injunctions.” The ones I seemed to have internalized were Don’t feel; Don’t be yourself; Don’t be loud (translation-don’t be heard); Don’t dominate (but when you perform, you must act like a star! ); and above all, Don’t disobey. As compensation for those unconscious injunctions, I followed the conscious drivers of Being Perfect; Being Pleasing; Being Strong; and Being Careful. These were my compensatory reactions to his depth messages that I was flawed, not worthy, should not be myself, and had to be always on the lookout for disapproval from any source. I could hear him cough and my sensory responses lighted up in a sort of vigilance, much like a rabbit who gets very still and perks up her ears. Early on, I began to be angry with him and learned that I could not express my anger with any possibility of a good outcome. He could out-do me in that arena. So, I stuffed my anger and chose to have asthma, instead. My asthma attacks were attributed to an inheritance from my grandmother who had asthma. She was my mother’s mother and, therefore, subject to some of his most scathing sermons. They said the asthma skipped generations, so I was subject to “inherit” that malady. I cried, I wheezed, I choked, and I coughed. I remember stifling my urge to cough once when we were going to the county Fair in Lubbock. He said to my mother, “If she can’t stop that coughing, we’ll have to go back home.” So, I struggled to hold back my explosion of coughing. Never did anyone wonder if I might have feelings or thoughts that would reveal how I viewed the situation. I will tell you about one more incident in my early adulthood. After I was married and before I had my first child, I had bought my own piano and diligently practiced a Chopin Polonaise. Mother’s family always played music when we got together. The occasion was Mother’s graduation from college (in her forties) and her siblings were present. I was asked to play and decided to do the Polonaise. This was a difficult piece and I was enjoying showing it off to my aunts and uncles. But my Daddy was talking throughout my performance. He was reacting to the dynamic piece to my uncle and I slammed my hands on the keys and left the room in a storm of anger. I cried and he came out to plead with me to come back in but I remained resolute and held my ground, blaming him for his interruption of my piece. I was medicated for heart palpitations following that outburst. As I birthed my children, his presence still could trip me into old feelings of rage and discomfort. Such was the extent of my neurotic symbiosis with my Daddy. He loomed large as my emotional nemesis. My self-pity was rampant and my blame of him was inconsolable. I did not experience the feeling of being loved, except by one or two relatives outside my family. More about them later, but now, eighty years later, I want to tell what I have discovered in this last year of working on unconditional self-love. I have experienced a genuine transformation. I like it and view it as an epiphany. I have uncovered a real truth from deep down in my psyche. The first fifteen years of my life were a training laboratory. It was a crucible much like the tumbling vat into which a raw stone is placed. If it does not break, it gets “shined” into a new formation. My Daddy was my early trainer-teacher-coach-mentor for my talent development and my chosen profession, which is that of counselor-coach-mentor-teacher. He was the force from which I became vigilant, aware, awake, and extremely sensitive to the feelings of others. I can walk into a teacher’s lounge, a board meeting, a classroom, or a group of any kind and my senses are tuned in to the vibrational energy in the room. This phenomenon is automatic, ingrained in my very state of being. Feelings, emotional turmoil, especially depressed, angry, or hopeless vibrations are on my radar without much effort from me. Another of my lessons from him is my comprehensive empathy for men, especially husbands and fathers. Their roles as providers and chief caretakers of our world, for the last five thousand years, has placed an undue burden on them. Wryly, I say it is since the first males declared that God was masculine. But that age is nearing its end with the beginning of the Aquarian Age. The rise of the feminine in both males and females is releasing men to be equal partners with women. We can share the load and the responsibility. They no longer have to be the one sitting on top of the pyramid, giving orders and commands. Wives do not need to obey husbands. In truth, obedience may not be the best development of any human being. The U.S. army now teaches that each troop is an army of one. I believe there is a leader in every chair. We, each individual, are an expression of the eternal life force, unique and significant. As I live this life, now in my 80s, I realize that I learned to be intuitive, to look and listen, watch and wait, be ever present from those fifteen years I lived in the house my father built. Literally, he built our little yellow, two-bedroom house with his own hands. He made a living farming, doing the hard physical labor to provide for his family. He managed to keep us alive, with food and clothing during a severe time of economic depression. He was a community and church leader, a pioneer who survived the dust bowl of the 1930s. He died, leaving us money, which was his prime inspiration and motivation. His money, in the form of CDs, was his pleasure, the result of his desires–proof that he had made it. Yet, he shared with me his fear of dying. Materiality does not spell worthiness. His behavior suggested that he believed dying meant failure, somehow. Oddly, when he died at age 90, his funeral was held in a church packed with admiring friends and relatives. The eulogies spoke of all the love and unusual power that he brought to the world he inhabited. More than one person said in effect, “They broke the mold when Odie B. McNeely was born.” He was a force to be reckoned with. One of his pastors told me that when he criticized something about how the church business was being conducted, he was usually right. My view of him was that of a little child, wanting to be loved and wanting to grow. His pleasure was my pleasure; his moods were my guiding light. If he was content, I was able to relax and be at rest. I never fully felt free to be myself for there was always the specter of his next outburst waiting to explode. I now know that children grow and learn through imitation and play. Playing usually involves loud laughter, screaming voices, and messiness. All of those were on his hit list, and I knew I could not engage in that kind of play around him. And, sure enough, I modeled my style of parenting after his. I was critical, punishing, negative, and all -powerful. To this day, I beg forgiveness for imitating him. My great shame as a parent of my incredibly loveable children is that I did not learn what it meant to create a home full of love and caring, with lots of permission for disorderly conduct and messiness. My standards were measured by his rules. I dreaded any visit from my parents if my house was not clean or my children were not exemplary, according to his judgment. Consequently, I placed the same pressure on my family that I felt growing up. His pleasure was the rule. Actually, it was more like avoiding his criticism was the rule. What I wanted to report in this writing is the transformation that has come in the past year. I focused on unconditional self-love, returned to the practice of self-re-parenting, and addressed with “merciless self-awareness” all that was required to approach such a daunting growth spiral. Today, I feel rid of and totally cleared of my resentments and blame of him. The process of forgiveness of him feels complete for me. My forgiveness holds far more than just understanding him and how he was the way he was. It is not about justifying his actions or moving past my own pain and suffering. I could tell you his story and we could agree that he came to his ways very legitimately, learning from his parents. So, there is no blame any more. I am not the Victim I thought I was. He was not my Persecutor. It goes deeper than that. Most of the therapy that I have done over the course of learning how to be a therapist was in some form of analysis or cognitive behavioral change. Gestalt therapy was a way of bringing to awareness what had happened and, of course, my father was usually in the “chair” whenever I was expressing my feelings. The net result was that I was convinced of my victimhood and that he was chief persecutor. Those gestalt sessions actually “rehearsed” more of my victimhood, making him the ogre and the cause of all my suffering. My self-pity was reinforced. Old style cause-effect thinking is too often our way of missing the real point of evolutionary growth. To my shame, I had a melt-down when he was dying and told him my feelings, all carefully rehearsed (in those therapy sessions), blaming him for never loving me and showering him with my explosion of anger, sounding very much like him in his prime of life. My sorrow is that before he died, I didn’t reach the stage of development I am describing today. Self-love and self-forgiveness are the real growth challenge. I want to believe that he knows at soul level. This new picture is what I would want him to know. I also want to declare that he did love me. I was his first-born and he poured out his whole self into my life development. When I left my childhood home, at age fifteen, he cried and said he knew I would never return. And I did not. That part of the story remains to be told later. I am telling this chapter of the story to reveal what I now believe about my story and the reason for my choice of this man as my father, before I was born into this life. Yes, I believe that we, at soul level, choose our parents. I was not a mistaken zygote, bouncing out of the basket and getting into the wrong womb or wrong family. I am awash in gratitude for him. I thank him for our relationship. My gratitude is strong for his merciless training program. The side benefit of my acute sensitivity to the moods and needs of others is my great gift from him. So, whatever our pact was at soul level, I am mentally sending the message that he did his job. If I, indeed, asked to have these talents and learn the skills and knowledge necessary to be a transformative change agent for people who seek me out for their own growth, then he was a player on my stage. He fulfilled my request – in spades. For that, I am full of gratitude. And I say from the depths of my being, Thank You, Daddy. I feel the tears well up for I know that I loved him from the very core of my being. And, I also know that he loved me. * For the first seven years of a child’s life, the brain operates primarily in delta (deep-sleep) and theta – brainwaves that travel slower than later in life. Alpha and beta waves develop later, so those early years are like being in a trance. Words, tone of voice, and facial expressions from caretakers are registered deeply in the psyche.